St. Patrick's Day is right around the corner and it's time to start thinking of some fun ideas to celebrate the special occasion. In honor of the holiday, I thought I would share some table decor ideas that were a little more on St. Patrick's sophisticated side. Don't get me wrong, I have nothing against those crazy little leprechaun's or pots of gold, there is just so much you can do by simply using green. So I spent about $5 and picked up a bunch of green chrysanthemum flowers and a couple of limes. 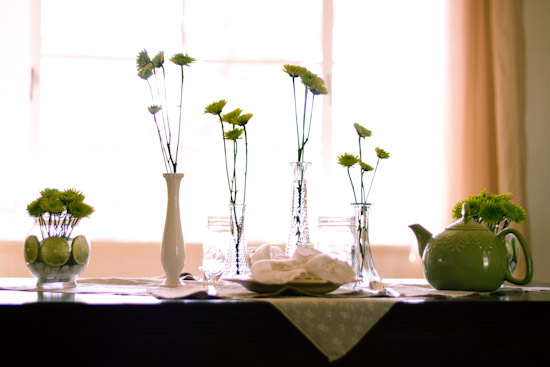 Then, I took them home and went through my random collection of glass jars and vases and started brainstorming. 1. 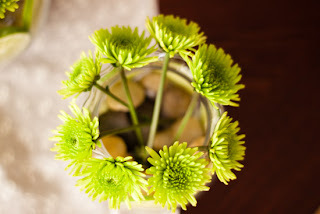 Green Chrysanthemum Center Piece: I simply trimmed the flowers of all leaves, cut the ends, and stuck them straight into some slender vintage glass vases. The straight lines add a slight modern look to the setting. 2. 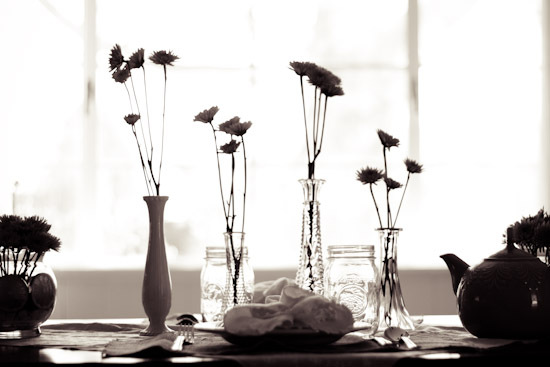 Place Setting: The place mat is a simple piece of cut burlap (I collect random fabric pieces when I see them on sale, just for occasions like these!) 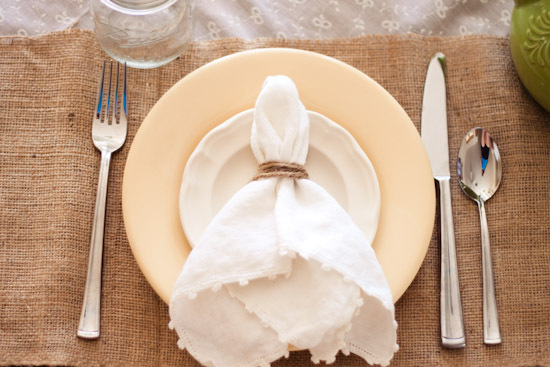 I created a simple napkin ring by wrapping twine around the napkin several times. 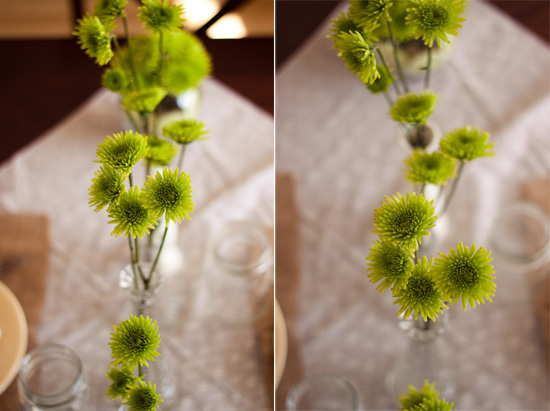 I added a lime to the center of the place setting for another pop of green! 1. 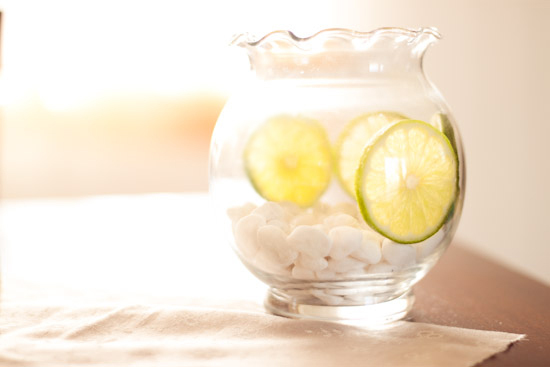 Fill your glass jar with decorative stones or marbles. 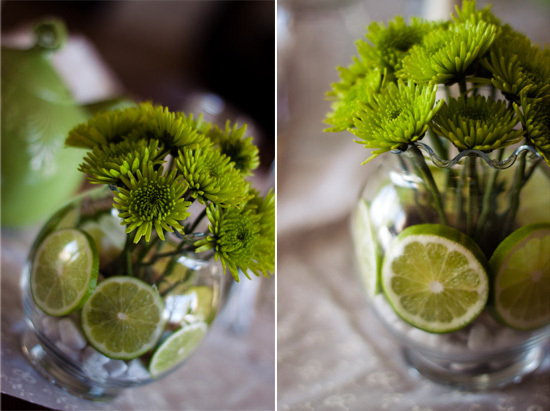 Then slice lime and apply pieces to the outer edges of the vase. 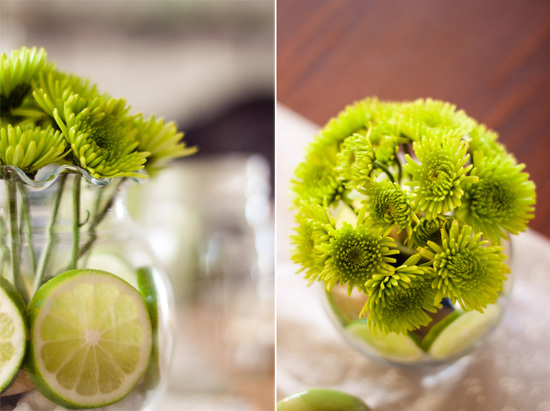 To help keep the lime from falling, place a couple of stones behind the lime after you set it in place. 3. 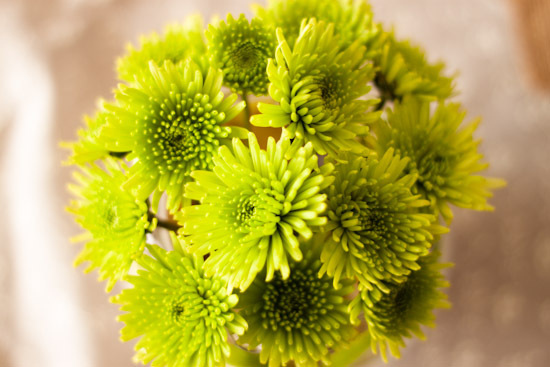 Fill in the center with remaining flowers and your done! 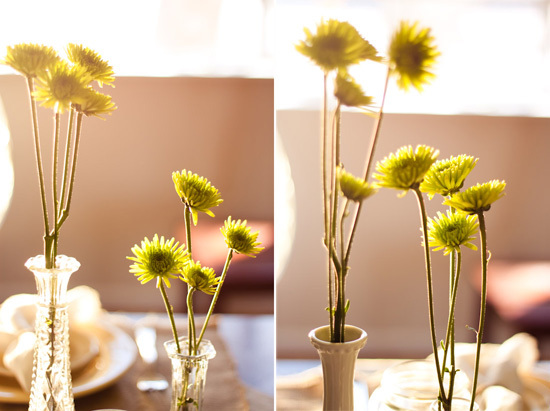 I didn't add water to my vases until later, I didn't like the "fish bowl look" when the water was in the jar. Andrea...its Melissa...remember me?!?! Just found this bog from facebook and I LOVE it! It's going to be my new obsession as I decorate my place. That desk down there...I have to recreate. Can't wait for the tutorial! Hey Melissa, of course I remember you! If you want the desk tutorial just click the "click here to read more button" under "Home Decor:Vintage Desk How-To". Glad you like the blog! Beautiful! 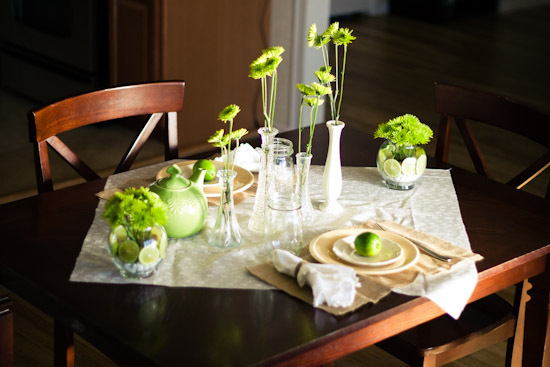 Love the fresh limes and burlap place mats. This is soooo pretty! So sweet! Love it!